Buy Now A coupon is available! Click to see the coupon code. This is a Buy 1 Get 1 FREE offer! Go to Store A coupon is available! Click to see the coupon code. This is a Buy 1 Get 1 FREE offer! Quick Links to Deal PricesHow does this work and how do stores get listed? See our disclosure below to learn more. add across dozens of our partner stores. 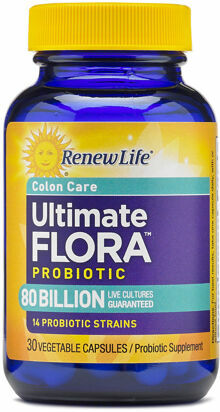 Ultimate Flora WOMEN'S CARE 25 Billion is a once-daily extra-strength probiotic formulated for a woman's special needs. Each capsule contains 25 billion live cultures of 10 strains of beneficial bacteria. Other Ingredients: Vegetable capsule (vegetable fiber, water), cellulose. For best results, take 1 capsule daily with a light meal. Consult your physician before using this or any product if you are pregnant, nursing, trying to conceive, taking medication or have a medical condition. Price ComparisonsHow does this work and how do stores get listed? See our disclosure below to learn more. PricePlow relies on pricing from stores with which we have a business relationship. We work hard to keep pricing current, but it is possible that you might find a better offer on your own. If you run an online retail store with a diverse product list, contact us to learn how to get listed. We'll notify you as soon as the price drops. *Note: Amazon Data is not used in PricePlow's price history graphs. You can then monitor any items you like. Check your inbox to activate the alerts. No statements on this page have been approved by the FDA. Contact a doctor and get written permission before beginning a new diet or using any supplement. Prices, labels, and product availabilities change frequently. We make no guarantee on the accuracy of any of the listings on this site.